There wasn’t a television special or even a press conference, but the entire world was made aware of LeBron James’ decision to return to the Cleveland Cavaliers 11 days into the new NBA calendar year, and just like that it felt like NBA free agency had official started. Sure, players agreed with teams before “The King” made his decision, but the big free agents and what felt like every team in the league were put on hold until James made up his mind. LeBron made his decision known through a letter on Sports Illustrated’s website (si.com) that, when read in its entirety, is as close to poetry as we might ever get in sports. In 978 words he found a way to address everything that has happened and what his plans for his future are, while also answering any question that anyone could possibly have. How things went down in 2010 when he left home (Cleveland) compared to how they went down in 2014 when he decided to come back home shows just how much “The King” has grown and matured in his four years in “college” in Miami. Usually going to college in a place like Miami probably does not have this much of a positive impact (the beaches, warm weather and night life can all be traced back to why students get poor grades), but hey we all know how different LeBron is from the average person both on and off the court. Before moving on with what the decision 2.0 means for the Cavs, the Heat, the Eastern Conference and the entire league I wanted to expand on two things that no one has really talked about: LeBron’s last game as a member of the Miami Heat (Game 5 of the NBA Finals) as well as his last home game in South Beach (Game 4 of the NBA Finals). The 17-point Game 5 loss in the 2014 NBA Finals turned out to be LeBron’s last game in a Miami Heat jersey, and this time there was no dramatic footage of James taking off his jersey as he exited the court through the tunnel in Boston like in 2010. As LeBron left the court in that video you could tell he was done; fed up with everything Cleveland. Even Mike Breen who called that game on ESPN asked the unavoidable question as the jersey came off of James’ shoulders. This time the exit happened in San Antonio as the Spurs celebrated winning the 2014 NBA Championship. While this time the jersey did not come off until he got back into the locker room, Bill Simmons of Grantland says he sensed the same type of feeling from LeBron in the AT&T Center that was present back in Boston in 2010. Cleveland. This was the exact reason why LeBron left the Cavs in 2010. He wanted help and wanted to have players around him that would show up when he needed them on the biggest stage and that simply did not happen in this year’s finals, particularly in Games 3 and 4 at home. Heat fans once again were called out on national television about a year later as they could be seen leaving Game 4 of the 2014 NBA Finals halfway through the fourth quarter as the game was already out of reach. This turned out to be LeBron’s last game as a member of the Heat. 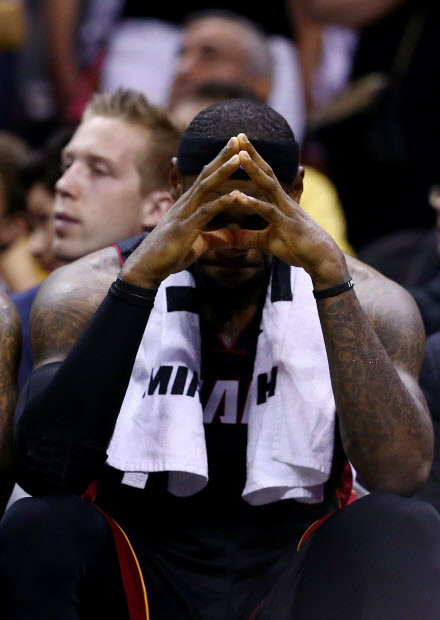 This time their punishment was just as bad: constant regret that they did not stay to watch one of the best players ever play his last home game in a Miami Heat jersey. LeBron, Wade and Bosh all deserved to be supported by their fans until the end of the game as many people thought at this point the series was not coming back to Miami. This is a big reason why I am happy LeBron left Miami. The King deserves fans who support and appreciate him as much as he loves them. So now when I sign LeBron James to the Cavs in the video game NBA 2k14 it no longer me dreaming; The King is actually coming home and we are all witnesses once again. 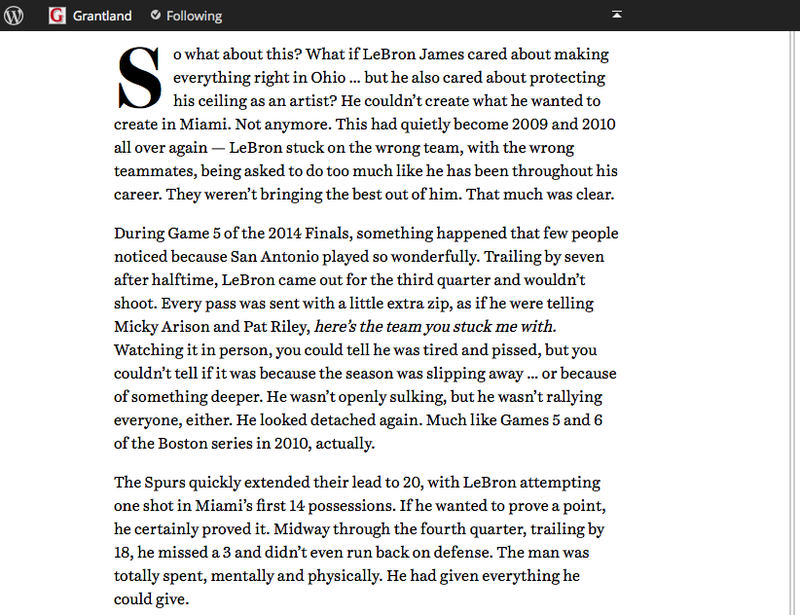 This entry was posted in Draft / Offseason, Home, NBA, Playoffs / The Finals and tagged 2014 NBA Finals, Cleveland Cavaliers, fans leave early, LeBron James, Miami Heat, NBA Finals, San Antonio Spurs, Sports Illustrated, The Decision 2.0. Bookmark the permalink.